Together Duke has targeted three challenges that reflect societal relevance, internal capacities for reflection and action, and alignment with Duke’s strategic priorities: Energy and Water Resources; Race, Religion, and Citizenship; and Population Health. Duke has the intellectual resources and organizational nimbleness to convene technical, legal, scientific, ethical, cultural, and historical explorations of these issues. By drawing on disciplinary depth, interdisciplinary strengths, and commitment to engagement, we have the capacity to make crucial research contributions in these vital areas and to serve as an important node for convening stakeholders. Through an open RFP process, we support the development of collaboratories – groups of faculty and students from across the university who collaborate to address aspects of each challenge. Collaboratories have three goals. First, they should harness Duke’s existing human capital and institutional capacities to advance understanding of, and provide tangible solutions to, targeted problems. Second, they should provide graduate students with a platform for learning how to engage with societal challenges and how to translate knowledge into action. Third, where appropriate, they should incorporate Together Duke’s focus on earlier, deeper, and more sustained two-way engagement with external communities and organizations. Access to secure and sufficient energy and water resources has always been critical for the security, growth, and well-being of communities. Today’s changing environment makes planning for that access particularly difficult, and emphasizes the urgency of adapting and building systems that are resilient to environmental transformations. The design of those systems is challenging on several dimensions: uneven access to high quality energy and water resources; risks posed by anticipated global climate change; and uncertain nature, scale, and location of future changes. Resilient systems must not only understand these factors, but be attentive to the social and ethical dimensions of adaptation. Processes of mass migration, whether forced or voluntary, are generating increasingly multicultural, multifaith communities in the United States and across the globe. Legacies of inequity and the diffusion of social and cultural diversity raise the question of how people with different histories and cultures forge a common life, despite divergent and often conflicting visions of human flourishing. Identifying the practices, policies, and norms likely to foster a just and generous common life requires understanding the sources of religious, racial, ethnic, and cultural identities; their political, legal, and socioeconomic histories and consequences; and the meanings and practices of democratic politics, citizenship, and other forms of affinity through which people identify, communicate concerns, and resolve disputes. Optimal health is central to well-being in modern societies. Improving and maintaining the health of a community involves more than access to individual-level quality health care: socioeconomic factors, community or culturally-based health behaviors, and environmental factors also impact population health. As such, policymakers across the globe are shifting away from a focus on individual health care toward optimizing health outcomes of communities. Central to this goal is the ability to analyze and visualize data to understand the root causes of suboptimal health, and to develop, test, and evaluate health care and health promotion innovations. Proposals must satisfy proposal guidelines and address one or more aspects of the three collaboratories: Energy and Water Resources; Race, Religion, and Citizenship; Population Health. Project funding ranges from $20,000 to $200,000 annually. Proposals may request funds for one, two or three years; the project budget should match the horizon of the proposal. Annual renewal will be based on progress to date, likelihood of success, and demonstrated collaboration. Continued funding is also contingent on project team participation in collaboratory activities including progress reports and periodic workshops. Principal Investigator (PI): The PI on the project team must be a Duke faculty member and be eligible per Duke policy. A faculty member may serve as PI for at most one proposal. Co-Principal Investigator (Co-PI): Faculty may serve as a Co-PI on up to two proposals. There should be no more than 5 Co-PIs on any given proposal. Eligible Duke faculty members do include those from the School of Medicine and the School of Nursing; however, proposals that include any faculty members from these units should have at least 50% of the total number of participating faculty come from other Duke schools. Funding recipients agree to the terms for inventions, patents, and licensing described in the research policy section of the Duke University Faculty Handbook. Capacity to educate, train, and mentor graduate students on engaging with societal challenges and translating knowledge into action. Proposals will be evaluated according to these selection criteria. 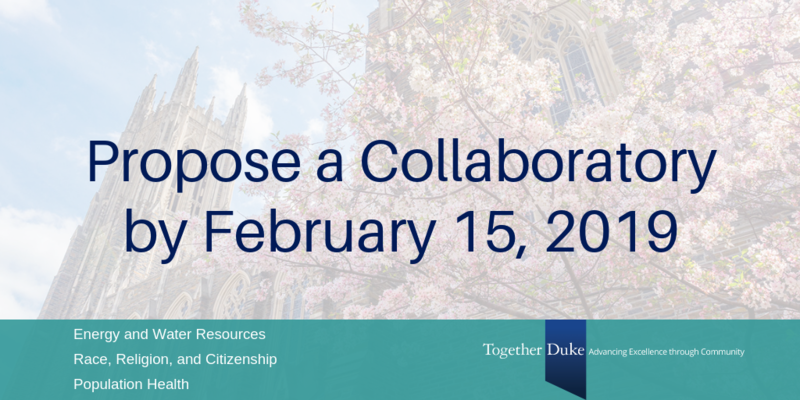 The Collaboratory Review Committee includes individuals from across Duke University. All proposals, and discussions thereof, will be kept strictly confidential. Abstract (maximum 500 words, 12 pt. font): Provide a nontechnical summary of the proposed project. Research Proposal (maximum of 4 pages, 12 pt. font): Describe the project in sufficient technical detail that it can be assessed by domain experts. Provide background and motivation; research objectives and methods; potential impact; and where feasible, envisaged pathway to implementation of the solution. Collaboration Plan (maximum of 2 pages, 12 pt. font): Describe the processes that will be implemented to facilitate sustained, meaningful collaboration among your team, as well as the plan to assess those processes and refine them as needed. Student Involvement (maximum 2 pages, 12 pt. font): Describe how graduate students, and, if desired, undergraduate students, will be involved in the project; what roles will they play; how will they be mentored; what are the key educational and professional outcomes they will possess as a result of their collaboration? Participant List: Provide a list of the project team members including name, email, affiliation, project role. Every proposal should clearly identify a project manager who will coordinate the project, including tracking threshold dates and metrics, capturing progress relative to that project plan, and communicating feedback to the collaboratory team. Budget and Budget Justification (maximum 2 pages, 12 pt. font): Provide a one-page budget (up to 3-year budget) and accompanying budget justification describing how proposed funding will be used and how it will enable success of the project team. NOTE: Collaboratory funds may be used for Ph.D. student stipend support. Please refer to the stipend schedule for guidance. Tuition remission on Provost grant funds has been waived by The Graduate School. Additional Funding: Brief description (maximum 1 page, 12 pt. font) of any other funding received from Duke or external funders related to the project (and/or any relevant pending grant proposals). Metrics for Success (maximum 1 page, 12 pt. font): identify key performance metrics for evaluating the project, including expected targets for those metrics at critical points in the project horizon (e.g., six months, one year, two years). Letter of Support: Supporting letter (maximum 1 page, 12 pt. font) from your unit (school, department, institute, initiative, center) that addresses the unit’s ability and willingness to provide administrative support for the collaboratory. To apply, visit https://www.ctsi.duke.edu/myresearchproposal and click on “Create New User” (or log in if you already have an account). Proposals must be submitted under the Principal Investigator’s name. A step-by-step user’s guide for applying via the MyResearchProposal software is available. Please review this document. Enter Access Code PROVOST then select the Provost’s Office: Collaboratories opportunity and follow the instructions. For any questions concerning MyResearchProposal passwords or system issues, please contact Lesia O’Hara or Anita Grissom at myresearchproposal@duke.edu. For any questions related to your project proposal, please contact Ed Balleisen, Vice Provost for Interdisciplinary Studies, eballeis@duke.edu; Jennifer Francis, Vice Provost for Academic Affairs, jfrancis@duke.edu; or Noah Pickus, Associate Provost and Senior Advisor, pickus@duke.edu. Any Duke faculty member eligible to serve as a Principal Investigator under Duke University research policies may apply. Our project idea is related to more than one collaboratory; what should we do? Great news! Your idea is very likely eligible for consideration. If you need help determining the Collaboratory that is most relevant to you, please contact Ed Balleisen, Jennifer Francis, or Noah Pickus. Our project idea doesn’t seem to fit within any of the collaboratories; what should we do? Sorry. Inaugural funding of the Duke Collaboratories will focus funding on research projects that fit within one of the three identified collaboratories. Future collaboratories may well address other themes, so please review again next year. Also, please consider whether your proposal would better align with other internal funding mechanisms such as seed grant programs run by university centers, institutes or initiatives. If you would like to discuss the possible fit of your project within this scope, please contact Ed Balleisen, Jennifer Francis, or Noah Pickus. Our project idea is not very interdisciplinary. Is this okay? Yes, we are interested in projects of all types that have a strong likelihood of resulting in tangible solutions. Is the Selection Committee looking for proposals for a particular collaboratory? No, each of the three collaboratories will receive equal consideration. Is this our only chance at submitting a project proposal? We plan to have RFP requests again next year, but the focal areas may change. Is there an optimal number of collaborators for a project team? While there is no optimal number of participants on the project team, we are expecting to see significant collaboration. We think a true collaboratory would have at least four core faculty associated with it. What kinds of items and expenses is the Selection Committee looking to fund? Are there items or expenses that are discouraged? We are keen to support funding for direct research-related items including, but not limited to, research assistance, research-related travel, partial graduate student stipends, workshops and other convenings, and data and data management. The funding is not intended to support course buyouts, course development, or new Ph.D. slots. What kinds of deliverables do you expect the project teams to produce? Great question! Deliverables might take a range of forms from peer-reviewed scholarship, white papers, and reports to digital and visual products and new databases. And of course, we expect the project team to prepare progress reports for review. We aren’t sure about the appropriate university unit to approach about providing administrative support for our proposed collaboratory. What should we do? Please contact Ed Balleisen, Jennifer Francis, or Noah Pickus to discuss possibilities. How are collaboratories different from other calls for proposals we’ve seen, like Bass Connections or Interdisciplinary Community Planning Grants (ICPG)? Collaboratories are a new opportunity to support groups of faculty providing tangible solutions to targeted problems. Students are likely to be part of such groups, but are not required. Bass Connections project teams, on the other hand, require participation of students at multiple learner levels. ICPG is aimed at faculty groups in the initial stages of exploration of a topic, to begin or test a new collaboration around a shared intellectual interest. What do you mean by two-way engagement? Two-way engagement refers to a dynamic intersection in which both the academy and society learn from each other. Benefits include asking better and more relevant questions, and learning how best to communicate ideas and findings to the public.